Now … I have to admit that the guys created a pretty good combo … it does taste like a PayDay candy bar! I don’t know why … I’ve never eaten candy corn and peanuts together. It makes sense … the whole salty sweet thing and all. Place all ingredients in bowl and mix. Store in air tight container. 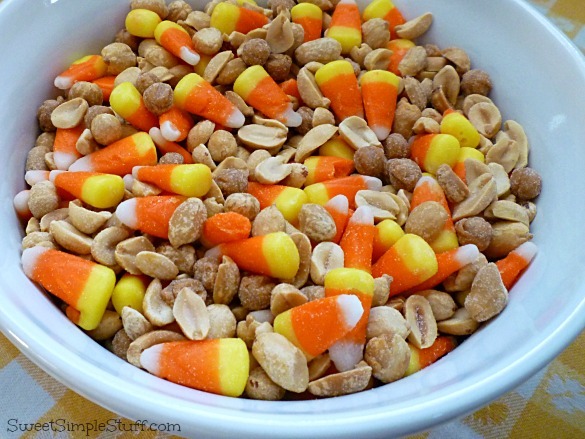 This is a winning mouthful … 1 candy corn, 2 peanuts and 1 caramel bit! Glad you tried the combo and liked it. It is amazing how much the candy corn and peanuts tastes like a Pay Day candy bar. 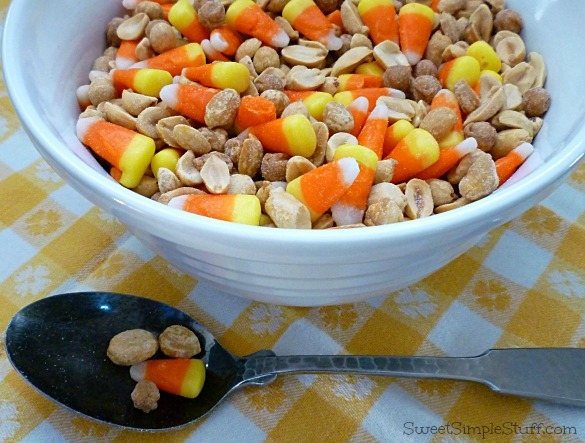 Whenever I have left over candy corn, I add peanuts to it. I used to live in Louisville and did attend the Kentucky Derby once. It was pretty fun betting on a horse and cheering it on during the race. I actually did win a bit. I think after making all my bets, I came out about $2 ahead. Definitely not a bit win, but it was cool to get to go to the winners window to collect my money! I was amazed that it really tastes like a PayDay! Here’s my method of choosing race horses … if the horse’s name has sugar, sweet, chocolate, etc. in it … I’ll probably bet on it … I usually spend a whopping $10 for the day! I am so ready to dig in! Looks so yummy! This is seriously the best snack ever!